A trip to the hills happened last week. Having travelled for a very long time, we stopped at a chai shop. We were pining to have tea….we badly wanted to get out of the car and walk around exercising our limbs that had almost gotten numb sitting since hours. A hot cup of tea is an elixir that drives away the exhaustion caused by travelling on hilly roads for hours. We sat on a flat plank balanced on stones while the owner prepared tea. In a corner of the shop sat a mottled glass jar, clouded by the smoke that emanated from the singeing log on which a dented kettle filled with tea gurgled merrily. The jar was half filled with jeera biscuits or “biskut” as the owner called them. 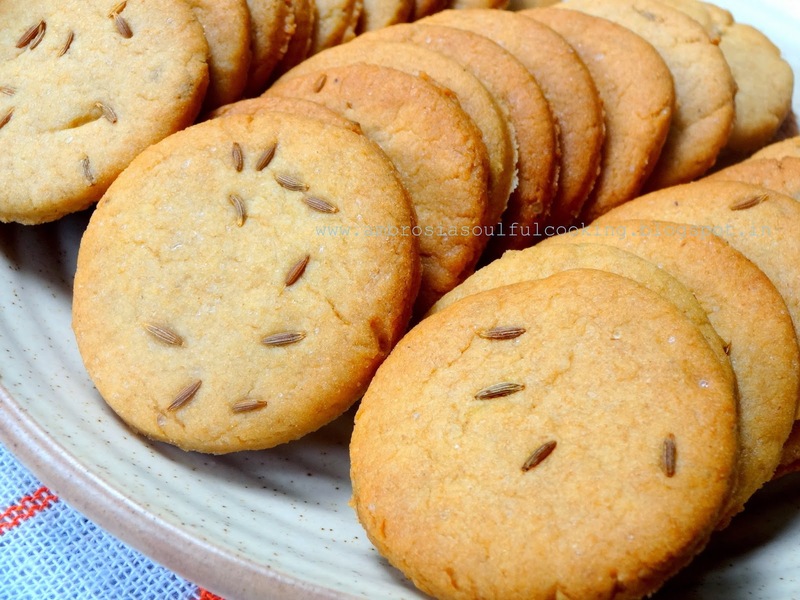 Jeera biscuits are the most popular goodies of the local bakeries here. One can find them in every road side stall. 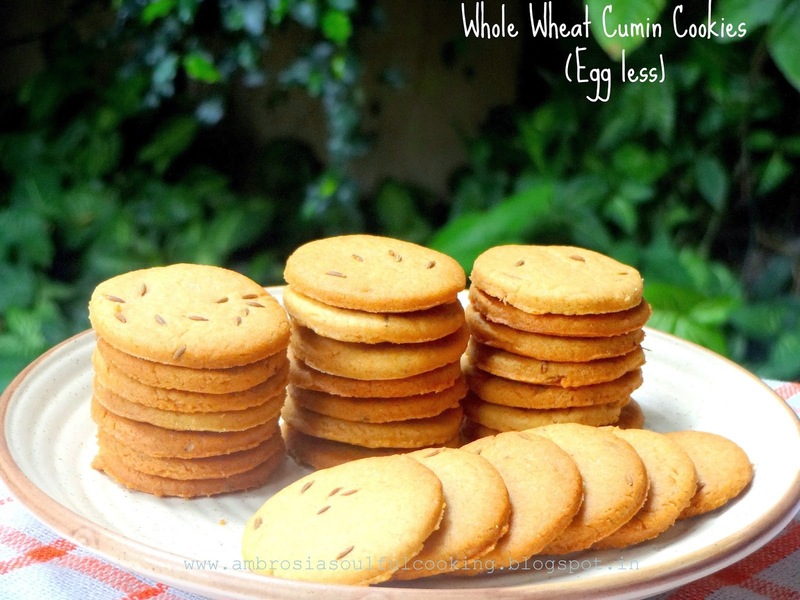 With a beautiful balance of sweetness and salt and with flavour of jeera that gets roasted while baking, these biscuits are unique in taste. I wanted to bake them at home. I baked my own batch this weekend. I used whole wheat flour and used table spread instead of butter. In a bowl whisk together whole wheat flour, salt, baking powder and baking soda. Add ¾ teaspoon cumin seeds. Add dry ingredients to butter sugar mixture and mix well till it resembles bread crumbs. Add milk. Begin by adding 2 tablespoons. Knead. Add 2 tablespoons more and knead. Add more milk only if the mixture feels dry. It should come together as soft dough. It should not be sticky. Preheat oven to 170 degrees Centigrade. Grease a baking tray. Roll out a thick chapatti of dough on the floured counter. Sprinkle a pinch of cumin seeds. Press them with the roller. Cut out cookies with a cookie cutter. Arrange them on the baking tray. Bake for 12 -15 minutes till the cookies turn golden. My notes- I used whole wheat flour. If you are using all purpose flour, you’ll require less milk. Also, you can make plain biscuits by avoiding cumin seeds, and adding ½ teaspoon vanilla extract to dough. Adjust quantity of salt accordingly. You might require just a pinch of salt for plain biscuits. What a wonderful presentation Namita. going to bake them soon. Hello Namita! 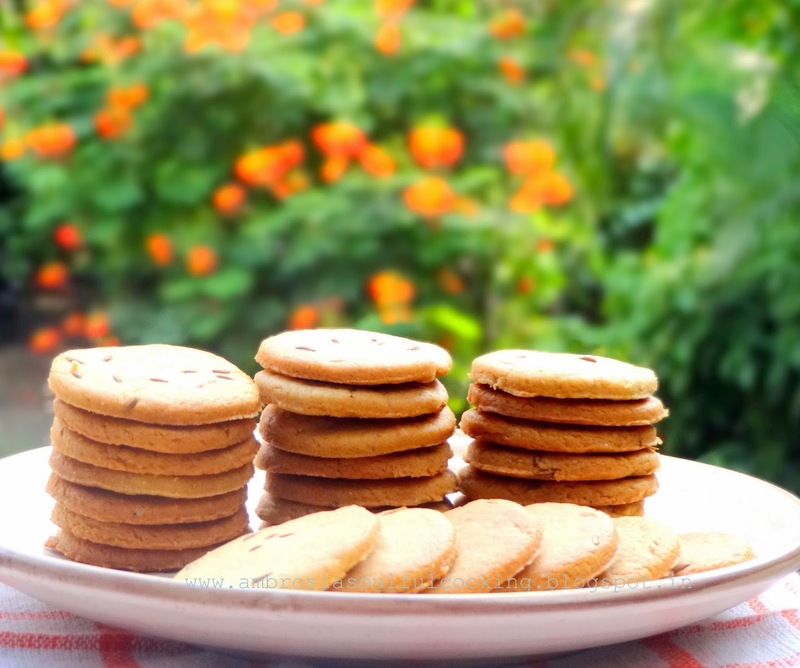 I like your blog very much and am pleased to see that you have turned vegan.I made Jeera cookies following your recipe and got wonderful results. I shared these cookies with family and neighbours and they were very happy. Thank you very much for a nice recipe. This will be a keeper recipe in my kitchen. Hello Jayashree, I am so happy that you tried these biscuits and loved them. I am on the way to becoming a complete vegan. Thank You for your kind words Jayashree! Hi Namita,your recipe is excellent.Came out superb.I did little change like instead white pwd sugar used pwd cane sugar and used half butter half oil.Thanks a lot for this recipe. Is the qty for butter 100 gms? Hello Shilpa, Yes, 100gms butter. If using 100gms of vanaspati oil then how much salt is required?? Hello! You will have to taste the dough to get the taste you refer. I have used butter which has salt. Your dough might require a little more salt. Possible to use oil in place of butter?? Hello Khyati, hearing from you after a long time :) Khyati, I would recommend butter. If you want to avoid it, try coconut oil. Oil might make the biscuits hard.